Almost every one of us hears the sounds and can to distinguish between the different characteristics. However, professional the musicians, who devote most of their time training, develop your ear to such a level that easily determine the key, chords, rhythm and composition. the First and most interesting as a unique musical talents is their earlier manifestation. Typically, gifted children show their abilities very early and in early childhood are different from their peers, durable and quick memorization of music and a penchant for creating music. 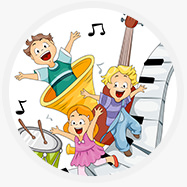 Children with outstanding musical talent, usually by two years of pure intone, and at the age of 4-5 years old learn to read music from the sheet, and often can play music expressively and intelligently. The geeks – it's unexplainable until science a miracle. Scientists particularly striking is the fact that artistry, technical perfection and maturity of his performances of young talented musicians is a better game adult professionals. Also an integral part of musical giftedness can be safely called a fantastic the possession of a musical instrument or even multiple instruments. Such a high skill level of the game opens up talents truly unlimited scope for creativity and freedom of expression. The tool for this genius is, first and foremost, a tool for deeply and inspired to reveal the contents of the music. A striking example of such unusual musical abilities is the art of improvisation on a given theme, during which the musician creates a piece of music literally on the fly and without any preparation. the History of music shows that any of the features of phenomenal music each gifted child is manifested in different ways. Russian musician and ringer virtuoso Konstantin saradzheva in early childhood was found a unique ear for music. At the same time for little genius all living beings and inanimate objects around had its musical tone, which, moreover, he was determined and in the color option. So, one of his friends Konstantin "seen" in the key of d sharp major orange hue. He sarajev claimed in one octave, it can clearly distinguish 112 of the sharps and the same number of flats of each tone. Thus among a huge number of various musical instruments he is stronger just singled out the bell. At the time, this brilliant musician has created a musical catalog that was made to sound spectra of all the bells, located in the Moscow belfries and more than hundred exciting tracks of the game on the bells. Professional the musicians of the cover band Orange Vinil, of course, can't compete with the geniuses. However, their craftsmanship, artistry and energy can easily turn any celebration into a celebration. Song for a wedding dance: recording or live music?